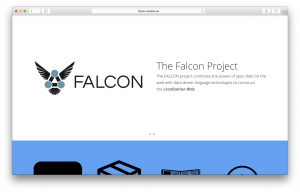 FALCON assembles a state of the art online translation tool chain that combines open source language technology and linked data with web site translation, translation management, computer aided translation and terminology management products. The automatic term extraction and statistical machine translation language technology components employed undergo iterative retraining to provide quality improvement within and between customer projects. The workflow demonstrates the integration of iterative SMT training with active curation of MT corrections and target term capture by post-editors in a live localisation workflow. Linked data is used to actively manage the curation and reuse of language resources between components. This data implements best practice in open data vocabularies for linguistic linked data, which enables its publication by the client as linked open data. The data schema supports fine grain declaration of usage right by all actors in the workflow, which can be reflected in data publication decisions. For more information please visit www.falcon-project.eu. This project has received funding from the European Union’s Seventh Framework Programme for research, technological development and demonstration under grant agreement no. 610879.